On July 25th 2010 in Istanbul, Turkey, young German table tennis star became the European Youth Table Tennis Champion by beating a field of top European juniors. Representing the Hanau TTC in the DTTL German League in the top division, Franziska is carving his way to the highest ranks of German players. Thanks for the interview Patrick! Also check out Patrick's blog here. I started to play when I was 6 years old. The semifinal at Junior World Championships in Team Event against Korea, we won 3:2 and I played my best table-tennis. What was it like winning the 2010 European Youth Championships? This feeling was awesome. The whole tournament I was not playing my best table tennis, but I was fighting. You have met a few of the New Zealand Junior players, what was your impression of them?They are very funny and laugh a lot. How much more of a step up from your level were the Chinese Juniors when you were playing under 18s? I think we had good chances against them .In JWTTC 2009 in the team final, I had 5 matchballs , and the other match from Floritz was also very close. 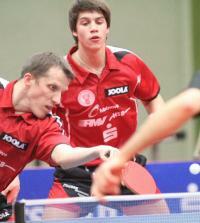 In 2010 JWTTC I lost 4:3 very close against Song, the World Champion. What do you think makes the Chinese so dominant in table tennis? They are very athletic, unbelievable power in their strokes and mentally, they are very strong. What do you think Europe needs to do to improve to compete with China and Asia? I think a little bit more power in their strokes, and just more practice. The chinese make no easy mistakes. If you were stranded on an island which team mate would you have with you and why? Steffen Mengel, we are good friends and are living in the same house.